Status: Restoration completed July 2011. Delivered to owner. Foster & Company of Rochester, NY was known as a high-quality manufacturer of mostly upright pianos in the 1920s. This fine instrument was originally built as a foot-pumped "Marque Ampico" instrument. 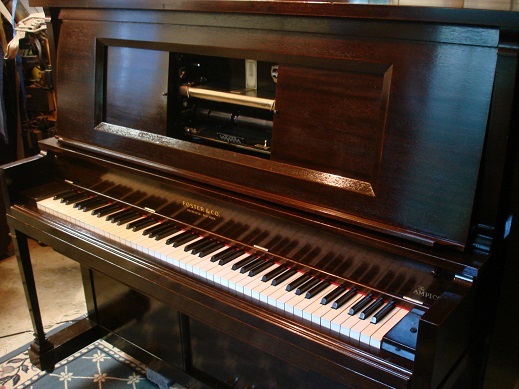 Several decades ago, its owner converted the piano to a fully automatic "Ampico A" by the addition of pump, motor, and standard Ampico A expression controllers and crescendos. However, the instrument was then damaged in a flood from a broken plumbing pipe, and was rendered unplayable for the last 15 years or so. Its owner arranged to have it sent to Historic Pianos for restoration of both the piano and Ampico player. The instrument required the expected restringing, hammer replacement, action regulation, and full restoration of the pneumatic player components. However, due to water damage, it required special attention to key levers, damaged ivory keytops, corroded metalwork, case and veneer damage etc., caused by brief exposure to quite a bit of water poured onto the instrument. After restoration, the piano was again very attractive in its original dark mahogany with new French polish hand-rubbed lacquer finish. And it sounded beautiful with its properly-scaled restringing, new hammers, restored ivory keyboard, and responsive action. The Ampico A performs excellently, as demonstrated in the nearby videos.